I don't know, these shots from The Verge look pretty good to me. They're not as artificially saturated as those from the Galaxy S3, but that's a good thing. I think that the difference between these pics and the pics from the phone I saw yesterday, is the difference between LCD and LED TV. LCD color looks good but a TV with an LED resolution is more vivid, bright and have more color depth. These pics don't compare to my eyes and I have 4 of them. lol. Not nearly as sharp as they should be. IMHO. It is the reason why I suspect Nokia used a professional camera crew and professional camera gear to demonstrate image stabilization before they got caught and why even now they promote its low light image capture quality and not the crispness of the shot, which is what they focus SHOULD be since the 900. IMHO. But if these pictures work for you, that's what counts. Not so much for me. Are you trying to say that the phone is using excessive noise reduction during daylight shots and that's the reason for the very poor detail? It's possible I suppose... I am not convinced yet, but I hope you are right. Either way, it's shocking Nokia would allow this to happen. Actually I am also confused with this. If they are applying noise reduction to the photos taken in daytime too, they blurry should be distributed almost equal across the pic, however, the center of the pics are always better than those on the outer areas. So I was doubting whether there's something wrong with the lens, as when Nokia is producing the device in a bigger quantity, they cannot keep the same quality as they did to the prototype device. It might not be a physical defect with the lense, but a software problem related to how the focusing mechanism. There could be another problem with the noise reduction as well. It's possible that there are two problems with the software. My inclination is that this is primarily a software calibration issue and not a physical problem with the camera. Almost all cameras are like that.. the edges of the frame will always be softer because of the they way the optics work, at least those tiny ones we have on phones. The wider the lens, the more apparent it becomes.. the 920s lens is pretty wide. Lets hope Carl Zeiss didn't mess this one up. The auto focus system plays a role too. Haven't seen this posted here yet, Nokia France's communications manager says they'll adjust the pictures for daylight. vp710 and Bkr11 like this. That is good news. I've been holding off to see if this gets fixed. Was even thinking about waiting for the next generation of awesome smart phones. Maybe some quad core wp8 action. I was never going to buy it for the camera. Really people overhyped "pureview". Pureview is still good for the Lumia 920 its just didn't meet expectations. I dont want a hideous big camera in the Lumia 920. Keep the design beautiful and simple. The camera is big enough as it is. TenTwelve, Smg-Uk and holyxiaoxin like this. Pureview is still good for the Lumia 920 its just didn't meet expectations. The whole point of a camera phone, is that its always with you. You shouldn't need to wait for perfect light, you shouldn't need to stand perfectly still to take a good snap/video. The Missus' iPhone takes great pictures in great light, but the amount of photos that are unusable, due to poor light a lot more than i'd like. A good camera phone needs to be versitile, and the hardware of the 920 seems to have that covered, even if it needs a bit of tweeking for the camera nerds. As a non-camera geek, the 8X, iPhone, Galaxy S3, 920, etc all take good photos during the day. Definitely good enough for me. The only thing they havn't really covered, is how fast the camera is. My HD7 is a nightmare with any sort of movement. The iPhone is exceptionally quick, so can take a photo of moving stuff easily. I've not seen much about that with any of the reviews. Even of the 8X, which is supposed to have a camera processing chip to make thigns faster. Well, Nokia has showed they respond promptly to bugs and have awesome customer support. That's more than can be said of their competitors. PureView has two versions at the moment, and that leads to some confusion on the subject. They bring two different set of attributes, both equally amazing.. 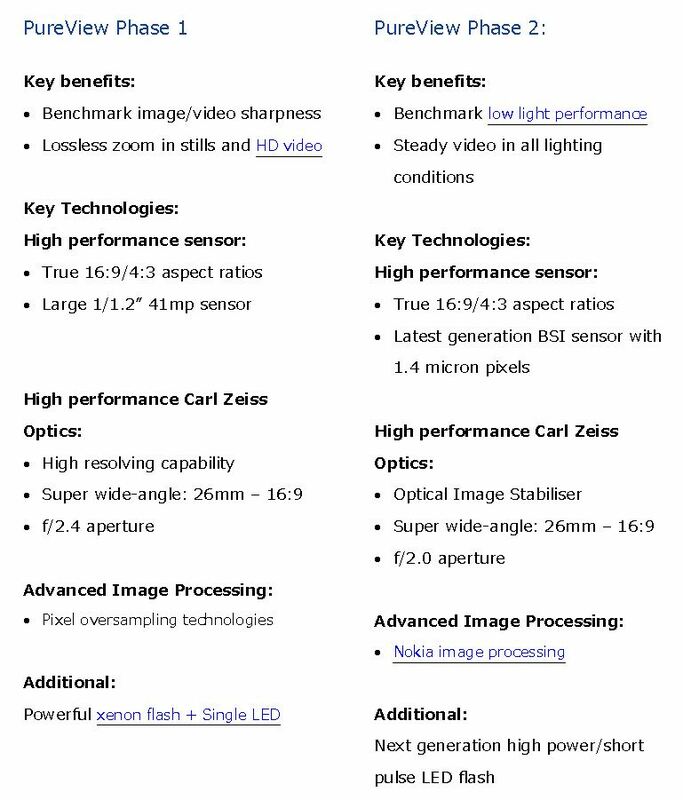 If you want sharpness, image quality, zooming: buy "phase 1"
If you want optical image stabilization, and better low light performance: buy "phase 2"
In both cases they are way ahead of the competition in their own right..
KoukiFC3S and vp710 like this. On the other hand, their competitors (HTC 8X or any other WP8 phone excluded) seem to be able to get product widely distributed for sale in a timely and logical fashion. That's more than can be said for Nokia. Smg-Uk and vp710 like this. Here is the full PDF document. Really interesting. So, we shouldn't expect a sharper image quality than what it is right now with Lumia 920? .. I don't think they are getting the maximum out of the hardware, just don't expect it to be at "phase 1" levels. They can still improve on the jpeg processing...just like they did with the 900. But yes, technically they can't be much difference between the two (900-920) when it comes to noise levels and sharpness. So the competitors can ship out crappy products out faster is a good thing. Gotcha. yes, they are very informative.. I really like the fact that Nokia does that, no one else does it. Here is the one on "Phase 1". ^ i don't know why this one won't go "clickable" .. Thanks for the respond, expecting 808 quality would be too much. I am expecting the same day-light quality as the iPhone's one, as i am currently switching from one. I take photos in the day-light and also want a WP8 phone, so 808 is not for me. Which iPhone do you have ? The 4 was pretty bad, then 4s was actually pretty good.. and now the 5 is slightly better than the 4s. But both of them are good in day-light.. not so much in low light. I have an iphone 5 and I am having a lot of problems with the flash... the thing won't focus fast enough and the pics come out blurry. I think that nokia can get very close to the iphone 4s/5 daylight performance.. even now the difference is not that big really. maverick786us and omaneschy like this. "This phone is awesome.. The bluring in the puctures is due to a stale firmware. Just wait until the first fw upgrade which is right around the conner. I live in Europe and was dissapointed to see all the reviewer's biased opinions (except Slashgear), so i ran over to a nokia store to get a hands on experience. The phone was a masterpeice of Scandinavian design (curves, the screen, details & the way it felt solid in my hands). Weight? No big deal, as u dont need to worry bout buy covers, it is made up of a very durable material. I asked the sales guy at nokia about the problem in daylight imaging nd he told me that he saw some reviews too and that this problem exists only in the phones with specific carrier branding in the UK and the US as they were released to them a month before the actual release. Out here our carriers sell phones from Nokia and therefore they come with the latest firmware." maverick786us and vp710 like this. I think their next batch that is suppoed to be released in rest of europe and Asia will have the upgraded firmware will have this issue fixed. 90% of the world is still waiting to get their hands on Lumia 920. The good news is Nokia will fix the normal light image processing and PureView will be everything as advertised.